Lighting A Revolution: Ink Blotter 112, "His Only Rival"
Blotter number 112; image number: LAR_B112. "His Only Rival. 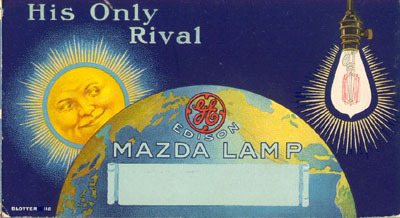 GE Edison Mazda Lamp." In 1904, General Electric began advertising a new carbon-filament lamp (the GEM lamp) as more energy efficient than older designs. Five short years later, GE salespeople needed something to help them sell a newer, metal-filament lamp of even higher efficiency. They invented a trade-name, Mazda, taken from the Persian (Zoroastrian) god of light, Ahura Mazdah. The Mazda name first appeared in 1909 on tantalum-filament lamps, and then on first generation tungsten lamps made under license from Europe. GE also licensed the name to their subsidiary National Electric Lamp Companies, to Westinghouse and to British Thomson-Houston. In 1910, William Coolidge at GE's research lab in Schenectady, New York, developed a way of drawing tungsten into a fine wire. GE quickly stopped making European-style tungsten lamps and switched to Coolidge's design. That lamp, the second generation tungsten lamp, became known in the trade as the "Mazda B." The earlier, European lamps were informally considered "Mazda A" lamps. GE continued using the Mazda name until 1949, when it was dropped during the settlement of an antitrust suit against the company. However, the company maintains rights to the trademark to this day. The only other Mazda product in the U.S. is the Mazda automobilenamed for the Zoroastrian god and also for company founder, Jujiro Matsuda. The Sun's Rival logo became the visual centerpiece of this early ad campaign, appearing on everything from lamp packages to billboards. It sought to convey the message of a brighter, whiter light than that produced by older carbon-filament lamps. While the logo eventually was eventually dropped, comparing the output of a lamp to daylight remains common in lamp advertising.